Once upon a time, in our backyard, there lived Penelope the peach tree. Actually, two lived there. 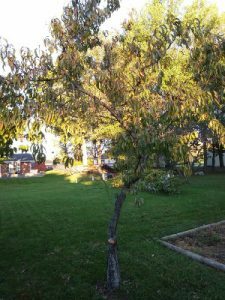 But even as we moved in, Percy the peach tree took one look at us, his new owners, and said, “There goes the neighborhood!” He never recovered. Visions of bubbling, crusty pie à la mode and caramel peach praline shortcake filled my salivating days. However, when Hubby thinned tiny, excess peaches from Penelope’s branches, she took revenge by producing three edible fruits — and a thousand that resembled green ball bearings rolled in pepper. The mutant peaches did not go to waste, however. I made jam as Christmas gifts for my less-than-favorite relatives. 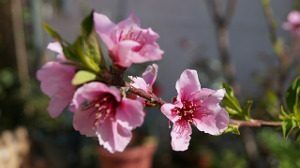 Penelope the peach tree can be temperamental. The following year, we respectfully requested Penelope produce real, peach-colored peaches, bigger than a marble. And no black rash, please. Some trees, like some people, can’t take constructive criticism. The following spring, she wore only a few sulky blossoms and no fruit. Our fractured relationship distressed me. My relatives started speaking to me again, once they knew they wouldn’t receive pepper peach jam at Christmas. It was a very sad year. Next spring, however, blossoms crowded Penelope’s branches. Perhaps she’d repented of her pettiness. More likely, she simply forgot. Peach trees aren’t known for sharp memories. When hubby thinned Penelope’s too-plentiful peaches again, I exercised caution when walking behind the garage, her domain. Would Penelope throw her remaining peaches at us? Surprise! Penelope’s green peaches grew from marble to golf ball to baseball size. So many loaded one branch that it cracked. She obligingly provided just enough greenish, pepper-dotted fruit to make Christmas jam for my relatives. 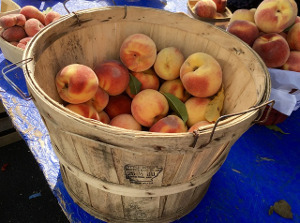 But Penelope’s peaches ripened in her time frame — not when I was free to pick, peel and slice. Because of writing deadlines, I remained chained to my laptop. Hubby made new weekend plans. As my dearly beloved donned an apron, we heard devious chuckles from behind the garage. Penelope exacts revenge on peach-pruners, one way or another. Hubby griped. But I had infected him with my pie and praline shortcake vision. He peeled and packaged. Is he a peach of a guy, or what? To Penelope, this ending to her saga may seem like the pits. But smiling at each other over hot peach pie and ice cream, we’ll take Penelope’s “happily ever after” every time! Your Extraordinary Ordinary: What’s your favorite peach indulgence? 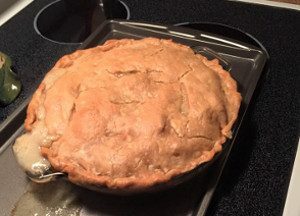 This entry was posted in Coffee Corner and tagged Food, Gardening, Harvest, Household chores, Humor, Rachael O. Phillips on October 18, 2017 by rachael.